A new airline arrived this month to the country. 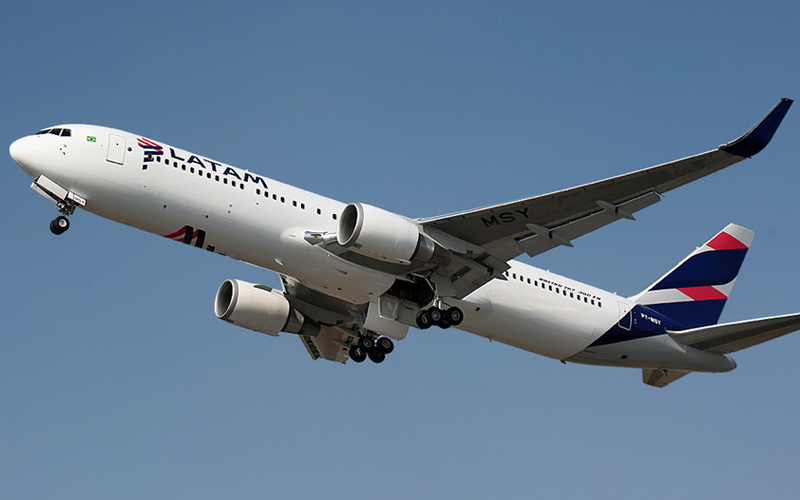 Latam Airlines, an airline with Chilean and Brazilian capital,made the maiden flight of this company on Tuesday with the route between Lima, Peru and San Jose, Costa Rica. It is the first time that the airline connects both countries directly. Tuesday, Friday and Sunday will be the days when the flights will be operated from the Juan Santamaria International Airport. Flights will depart at 4.45 pm and will be arriving to Lima at 9.25 pm. Return flights to Costa Rica will operate the same days, departing from the Peruvian capital at 12.50 pm local time and will be landing in the country at 3.25 pm approximately. Starting in March, an additional frequency will be added and 4 weekly flights will be operated on Tuesday, Friday, Saturday and Sunday. This will mean an increase in the offer, with 66,144 seats available. The flight from Lima to San Jose, the capital city of Costa Rica, will have a duration of 3.50 hours and will connect quickly with flights from Santiago (2 available flights), Buenos Aires, Mendoza, São Paulo, Rosario, Salta, Tucumán, Córdoba, La Paz, Antofagasta, Santa Cruz, Montevideo and Asuncion. On the way back, the flight from San Jose Costa Rica will connect with the same destinations. LATAM Airlines Group is the main airline group in Latin America and one of the largest in the world in terms of red, connections for air services in Latin America, Latin America, Argentina, Brazil, Chile, Colombia, Ecuador and Peru, as well as international operations within Latin America and to Europe, the United States, the Caribbean, Oceania and Africa. LATAM Airlines Group is made up of more than 43 thousand employees and operates more than 1,300 daily flights, transporting 67 million passengers per year. With a modern and young fleet, LATAM Airlines Group has 306 aircraft, among which are the Boeing 787, Airbus A350, A321 and A320 neo models, the most modern models of its kind. Since 2000, LATAM Airlines Group is a member of the one-world airline alliance, comprised of 14 leading aviation airlines. Through this alliance, the Group offers its passengers more than a thousand airports in 159 countries, with nearly 14 thousand daily departures. LATAM Airlines Group is the only airline group in Latin America and one of three in the world to join the Dow Jones World Sustainability Index, where for the fourth consecutive year it was highlighted for its sustainable practices, based on economic, social and environmental criteria. With the incursion in Costa Rica of Latam Airlines, the country reaffirms its strategy to enter more strongly the South American market, which had remained calm during the last years. This is a great opportunity to increase the number of visitors entering the country as well as the opportunity for locals to visit other destinations easily. "This new route is excellent news for tourism and connectivity in Latin America, strengthening our unique network of destinations. Costa Rica is a destination recognized worldwide for its nature and outdoor activities, "said Enrique Cueto, executive director of Latam Airlines Group. According to the company, more than 2 thousand Chileans have already purchased tickets to fly to Costa Rica. Latam offers tickets from $ 728. The airline was created by the union of Lan Airlines of Chile and Tam of Brazil, a merger that took place in May 2016. According to Héctor Iriarte, Managing Director of Latam Airlines, Costa Rica is a worldwide recognized destination in which they see a strong and stable economy; which is attractive in terms of market. He said that they have observed that Costa Rica has visitors during all year round and from all over the world for several years ago, thanks to the promotion efforts made. “We are interested in Costa Ricans traveling to South America and contributing to the generation of air traffic”, said Iriarte. The manager also said that they are planning to start with three weekly frequencies, and then they will be adding a fourth additional one, which eventually and according to the weekly demand will become a daily flight too. Their main goal is to offer competitive rates to all their market niches: the corporate, traditional and ethnic tourist. The airline has already confirmed some eight thousand travelers who will leave Lima to Costa Rica since the new route was announced in June 2017. This means that the different tourist activities of the country will be benefited with the arrival of more potential tourists coming from South America during this 2018. Costa Rica has a very professional and highly compromised team with the attraction of airlines and tourist promotion. For Latam Airlines this is very important as it splices their identity as a company, that is why since the beginning the airline was in close contact with authorities working in a coordinated way. Actually, Costa Rica is the only destination in Central America that the airline arrives at. Mr. Iriarte says that their main goal is to strengthen their network of flights to South America, in which they have three main hubs: Lima, Sao Paulo and Santiago. The fact of having their first destination to Central America will allow them to strengthen that network of connections and the Costa Rican market is the ideal place to do that as it gather these conditions they are looking for. The airline expects the route can be maintained for a long time, trusting that, with the help of travel agencies, competitive rates and a lot of promotion, it may wake up more in the Ticos that taste for travel to the Southern Cone, and take advantage of this flight not only as a destination final but also as connection. And for other foreign travelers to come and enjoy some Costa Rica vacations anytime. The executives of Latam Airlines know that the competition will always be positive for the client because it generates a supply and demand that makes prices more attractive; but they expect their difference by offering the best service will be the reason for which more travelers decide to flight to Costa Rica and to South America with them. September 27th World’s Tourism Day: Why you must choose Costa Rica for your next vacations?